What’s the difference between Swannies Day and Night lenses? Are you curious about the difference between Swannies Day and Night lenses? Perhaps you’re wondering which Swannies will become your life saver. Well, you’re in the right place. In today’s article, I’m highlighting the purpose and benefits of both day and night lenses. Let’s see how both day and night lenses work. How do Swannies Night lenses work? Our orange-tinted Swannies Night lenses block nearly 100% of blue light between 400-500nm and have been designed to wear before bedtime, preventing blue light from causing sleep problems. Blue light between 450-480nm has been shown to suppress the production of the vital sleep-promoting hormone, melatonin. Ideally, at night time blue light exposure should be limited as much as possible to ensure a healthy sleep-wake cycle. As the sun disappears, this signals to your body to prepare for sleep. Aligning ourselves naturally has become a major challenge in the digital world, as we are constantly over-exposing ourselves to harmful blue light coming from every direction. You might be reassuring yourself that your blue light blocking app is doing a great job, but think again my friend. You will be shocked to discover how ineffective Apple Night Shift really is. This is where Swannies Night lenses step in. Wearing Swannies at least 2 hours before bedtime has been shown to drastically improve your sleep. Whenever I forget to wear my Swannies at night, my body quickly reminds me the next day why it’s absolutely crucial to remember. I end up tossing and turning at night, not only resulting in a sluggish but also unproductive day. Emily Binder, a successful marketing strategist who spends hours in front of her blue light emitting devices has given Swannies blue light blocking glasses a try. Check out her full review and experience in the video below. Here’s a tip for extra sleep assistance. Optimize all areas of your life by making this night-time treat a pleasant part of your bedtime routine. How do Swannies Day lenses work? Our almost-clear Swannies day lenses are particularly designed for screen-time during the day. 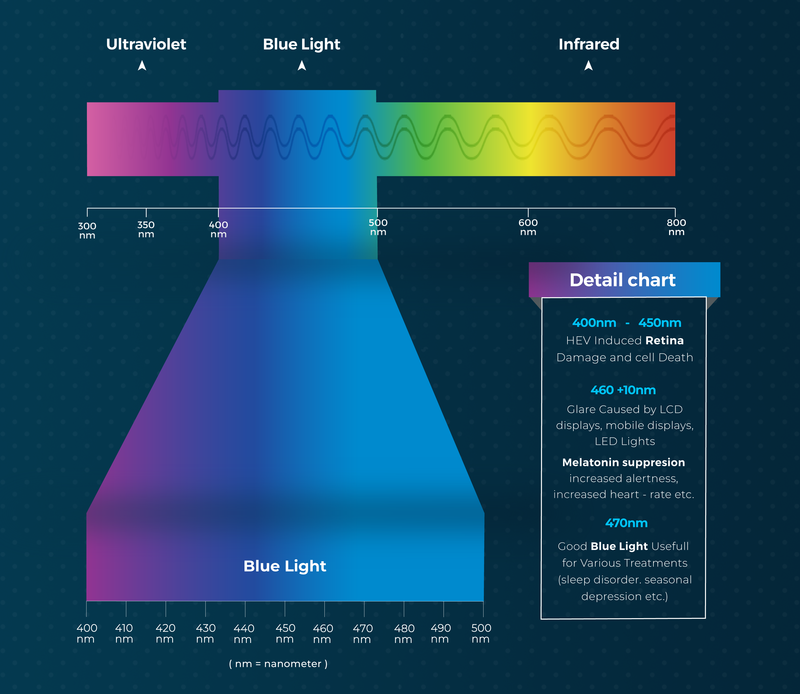 The Day lens blocks between 40-80% of blue light between 400-450nm, which studies suggest, is the most harmful part of the blue light spectrum. Now, you might be wondering how exactly can this benefit you? 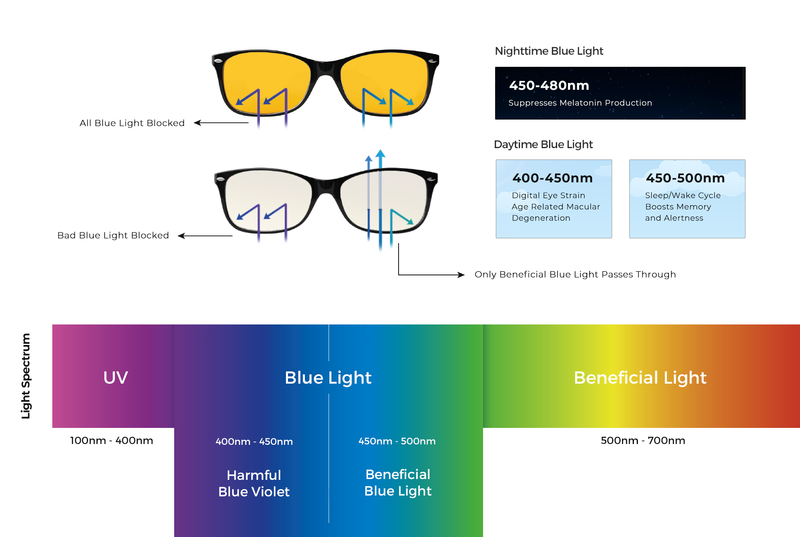 The purpose of the Day lens is to allow some blue light between 450-500nm through, to signal your body that it’s daytime and that you should be awake. Furthermore, blue light exposure during the day is crucial to help boost alertness, improve your memory and cognitive function, and reduce seasonal affective disorder. Additionally, the Day lens maintains color fidelity when working on your digital screen during the day. Bonus! While our Swannies Day glasses provide these amazing benefits, it also protects your eyes from digital eye strain. Are you experiencing dry eyes, blurred vision, and headaches? Read why it happens and what you can do about it. There it is! 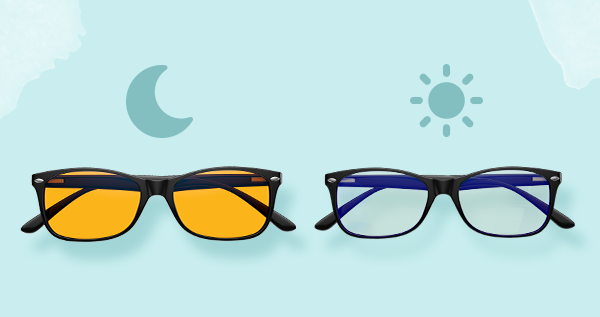 The difference between and the benefits of day and night glasses. Day Swannies help you protect your eyes while using your digital devices during the day, and Night Swannies block harmful blue light once the sun goes down. As an added benefit, both Swannies are 100% UV rated for that extra protection. Get the best of both worlds with our Day & Night Blue Light Protection Set. Celeste is Swanwick’s priceless content writer from South Africa. She’s a musician, nature enthusiast, and even an achieved photographer with her own side hustle that keeps picking up steam! (Check her out here www.celestepolley.com.) She makes it her responsibility to encourage others to adopt a healthier lifestyle, and she focuses on the importance of good sleep habits. As a busy entrepreneur, she knows how beneficial it is to spend quality time with your pillow.